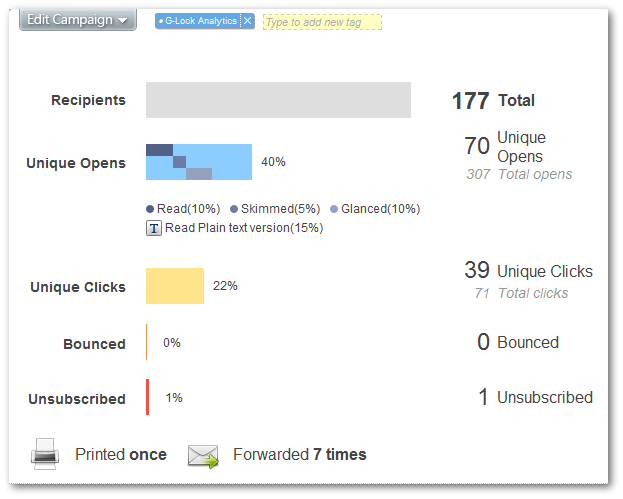 Track Your Email Campaigns in Real Time! G-Lock EasyMail is integrated with G-Lock Analytics – email tracking service – which helps you clearly understand what is happening to your emails after they are sent. Email tracking stats are saved to your account on G-Lock Analytics. Track those who opened your email many times. You can define the number of email opens to determine most engaged recipients yourself. We provide you with an unsubscribe link that you can add to your email so that your recipients can remove themselves from your list. Unsubscribes are collected in your account. G-Lock Analytics is a standalone service. The price for G-Lock Analytics is NOT included into the price for G-Lock EasyMail license. Read here about G-Lock Analytics plans and pricing.